Your Best App Promoter? Your Pastor! Having the priest’s “blessing” of the use of myParish App is a terrific boost for a parish. Some priests are really impressed right from the start, and others may need a little more time. Either way, having the pastor endorse the use of the app means people will really take notice. After Mass has concluded, have Father ask everyone to take out their cell phones. Yep, that right: Father said take out your cell phones! If folks don’t have the app, tell them to text “APP” to 88202. And you’ve just gained a bunch of app users. It would be a good idea to include information about the app in that week’s bulletin. Don’t forget that Launch Kit! There is a t-shirt in there for Father. It would be great if Father could wear that t-shirt for refreshments after Mass, parish social events, etc. 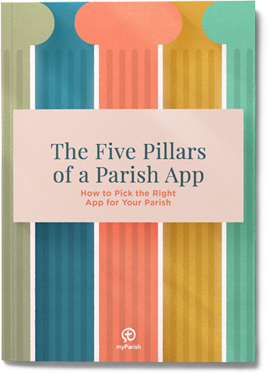 It’s a fun and effective way to let folks know that the app is important to parish communication.